Always the colorfully dressed Metropolitan, leader of Believers’ Eastern Church and CEO of Gospel for Asia K.P. 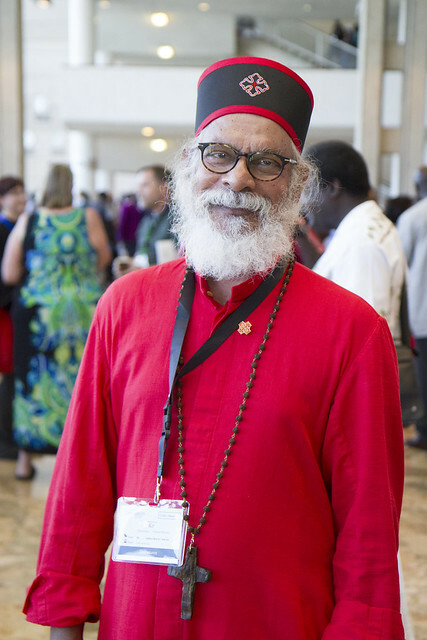 Yohannan served as a delegate at the recent GAFCON 2018. GAFCON stands for Global Anglican Future Conference and was initiated after the U.S. Episcopal Church consecrated gay man Gene Robinson as a bishop in 2003. K.P. was featured in an article about the fashion on display at GAFCON. The extravagantly-coiffured are not limited to the ladies – a couple of Anglican males would give the sisters a run for their shekels. It has been whispered that there will be a competition for the most outstanding beard – a tip that came three months late for me. Seemingly set for any time, any day, any place, the Indian Metropolitan, the Most Rev. K.P. Yohannan, from Believers Eastern Church in Kerala, on the Indian eastern seaboard, would be hard to beat, being imperial in both attire and beard. Yohannan’s bright red cassock, white mane, and genteel character make him an instant attraction for those seeking trip-defining photos to take home. Apparently, Believers’ Eastern Church is considered to be an Anglican church. GFA has always portrayed their work as evangelical and Believers’ Church as evangelical. GFA recently had a petition for writ of mandamus denied by the 8th District Court of Appeals in their fraud case Murphy v. GFA. The practical impact of the Court of Appeal’s action is that a special master will be appointed to open GFA’s records and oversee discovery in the case. GFA had been sanctioned by the federal judge in the case for abusing the discovery process and failing to provide documentation of how donations had been spent in keeping with donor intent.